I’m planning to take L2 next year and I’m looking for some study recommendations. I passed L1 last December and was fortunate to have almost unlimited time in the five months preceding the exam. With L2, however, I’m not going to be able to study very much from February to mid-April due to tax season (I’m a CPA). My window, essentially, is anytime through 2/1/11, and anytime after 4/15/11. During tax season, I can study, but with limited hours only. Given my situation, I’d appreciate some suggestions in establishing the best strategy. I don’t know how much time you actually have, but I had a newborn son and wanted to hang out with him as well. Unfortunately, I just had to make it a long night, every night, from about 9:00-12:00 andI had to deal with lack of sleep for awhile. Now, I’m really enjoying my free time! That’s why I skipped 6/10, because I knew I couldn’t prepare in four months with tax season right in the middle. But now I have a whole year to prepare – it’s just that there’s an important window of time in which I’ll be sidetracked. FWIW, I’ll always have this issue (unless L2 is offered in December one day). It’s my reality. Remember, I have most of the next year to prepare (but for that 2.5 months). I plan to start this summer, but I need an effective strategy given my reality. > deal with lack of sleep for awhile. > Now, I’m really enjoying my free time! Tought stuff guy - I’d go hard August to busy time, and then have strong review structure from then (notes/old samples/qbank). Then come 4/15 hit all CFAI EOC/summaries, do CFAI samples early may, review, then 2 weeks before do CFAI mock and review again. I think it’s do-able, but you’d (or at least I would) need to commit an hour or more a day a 3-5 days a week during that busy time as well, to keep stuff fresh. During busy season, bring flashcards during “down time” in the loo. Good use of five minutes. There really is not that much benefit to starting early other than to complete the readings. I would say if you can complete the readings by April 15th, you can do an intense review for 6 weeks (questions, exams and problems) and you should be ok. There is so much memorization to this test that starting early really is of no benefit. The last month is the key. I’m thinking I’ll attempt to finish the readings by January. In March and early April, I’ll do continued reviews of the material to keep my memory fresh. Once 4/15 rolls around, I’ll pick things up. With L1, we studied Economics first, about five months in advance. By the time I got to my final month of preparation, I had forgotten almost everything. I just need to find a really good strategy. Failure is not an optin. > benefit. The last month is the key. take your own notes as you study and try to complete the EOC questions as you go along, then go back to them as part of your review. -Start early and try to have already gone through the curriculum by March. This way you can do flashcards/sample questions during the really busy time of year. -Don’t neglect your studies during the March-April period, just scale them back. It’s not possible to stop studying for 6-8 weeks and then “make up for it”. Again, my friend points out that if you’ve gone through the curriculum once, you can just do sample questions and flashcards whenever you’ve got 30 mins or an hour. That format of studying lends itself to shorter study sessions. -After April 15th, lots of CPAs have substantially less work to do other than mopping up loose ends from tax season. If you can get a week or two off, or start taking three-day weekends for a month (yes, really), you can get an enormous amount of prep done. Supersad: I appreciate your comments. I was thinking that I’d do two complete passes through the curriculum. I’d do the first pass starting in late July when registration opens without doing any of the EOC questions, etc. After completing the first pass perhaps in late fall, I’d go back and re-read everything, doing all the EOC questions, so I was done by March. Hopefully from then until the actual exam, I would keep taking as many practice exams as are available. For me, I simply wish there were actual prior exams available. This is how I got through the CPA exam many years ago. 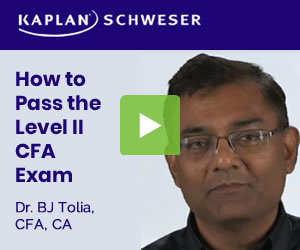 Level 2 is a lot harder than the CPA, I don’t think you need a strategy except study every little opportunity you can get.